Location: 37 57 30S 143 12 00E (external link); 7522-3-S (Derrinallum South) 927961. 1 km SW of Derrinallum. Hamilton Highway. A 'virtual aerial tour' of Mt Elephant is provided in this video clip. This low quality video clip runs for 1 minute and 23 seconds and is 1.8MB in size, which will take some time to automatically download if you are using a slow internet connection. We also provide a high quality version of the clip, and to view this you need to click on the 'HD' button that appears in the navigation controls for the player. This high quality version of the clip is 4.3MB. Land Tenure/Use: Private land. Bare, grazing. Large operating quarry complex on lower western slopes and smaller disused (former Railways quarry) nearby. Type 5: Scoria cone with breached crater. Mount Elephant is a steep, isolated scoria cone rising almost 200 m above the flat surface of the surrounding lava plain. It is a single eruption point with an irregular rim caused by directed fire fountaining. The rim is breached on the north-eastern side giving an opening to a dry shallow summit crater with minimum enclosure of 20 m. The breach may be the result of collapse or removal of part of the rim during a small lava flow late in the eruption history of the volcano. There are few natural exposures on the mountain but several operating and abandoned pits at the base provide sections into the ejecta. This consists entirely of magmatic material (i.e. without phreatomagmatic) in the form of scoria, blocks and bombs without abundant xenoliths and megacrysts. These occur both in basalt rocks and scoria. Occasional small angular blocks of partially melted granitic bedrock also occur as xenoliths. 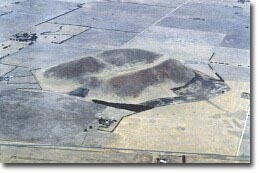 National: Mt Elephant is one of the most obvious volcanoes in Australia. It has conical form, steep sides, a crater and clear examples of volcanic ejecta are displayed in the quarries. 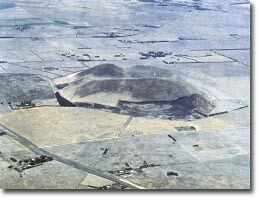 It is the best example of a breached scoria cone in Victoria and possibly in Australia. This is also a major megacryst/xenolith site. Breached crater of Mount Elephant. References: Grayson, H.J. & Mahony, D.J. 1910. The geology of the Camperdown and Mount Elephant districts. Geological Survey of Victoria Memoir 9. Ollier, C.D. 1967a. Landforms of the Newer Volcanic Province of Victoria. In J.N. Jennings & J.A. Mabbutt (eds). Landform studies from Australia and New Guinea. ANU Press, pp. 315-339.